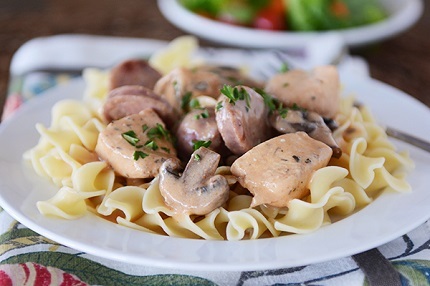 I rarely post a recipe without making it at least twice (oftentimes more than that even) and this simple and super yummy Cajun stroganoff is no exception. I’ve made it five or six times over the past month or so: serving it to company, taking it into a friend with a new baby, and just a couple of times for our own weeknight family dinner pleasure. Because it’s really, really delicious and I learned quickly that no one complained (I even got a Toyota jump from my 11-year old) when I announced it was Cajun chicken stroganoff again for the win. Let’s talk chicken sausage for a minute, shall we? I’m referring to the pre-cooked, non-crumbling variety of chicken sausage. I’ve seen chicken (or turkey) sausage in the U-shape links that would work here. I generally pick up a package of the Aidell’s brand (no affiliation) at Costco (I’m partial to the pineapple and bacon) and keep it in my freezer. In a large skillet, I drizzle in a little olive oil and then toss in the sliced sausage, cubed potatoes (Yukon or red), chopped cabbage and a healthy dose of salt and pepper. Cook it up until everything is nicely golden and tender (put the lid on and let it steam a bit, too) and dish it up. Totally old-fashioned and homey but very tasty (my kids drizzle it with ketchup, of course). 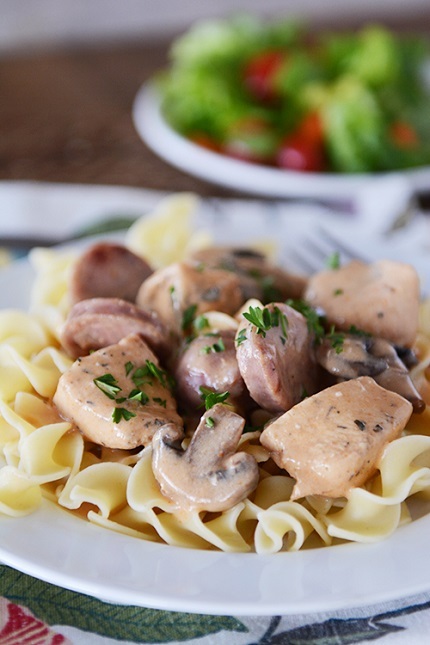 Back to the recipe at hand; this stroganoff is fabulous. 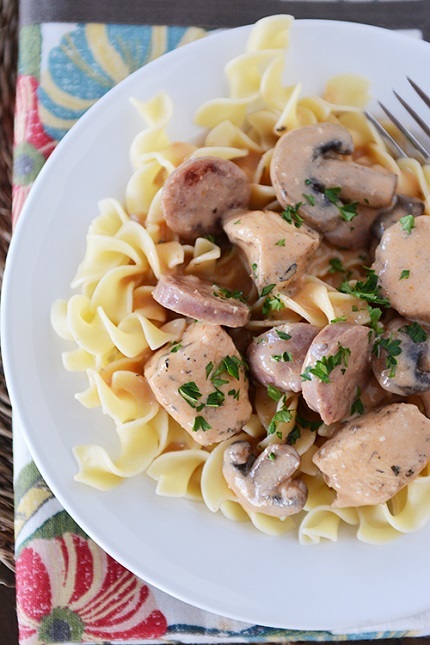 The flavors are simple but perfect with the tender chicken and sausage, and FYI: the creamy sauce is drinkable. We love this over hot, cooked egg noodles (be a rock star and make your own? maybe?) but you could also serve it over rice or quinoa or whatever your little heart desires. Hallelujah for yummy, easy dinners! Hal-le-lu-jah. It's important to remove the skillet or pot from the heat before stirring in the sour cream at the end so it doesn't curdle or create lumps. The sauce will thicken slightly if not served right away but if you want it even thicker, consider upping the flour by a tablespoon or so. If you can't find chicken sausage (I usually buy the Aidell's pineapple/bacon sausage at Costco), you can use kielbasa or other type of precooked sausage that you slice into rounds (not the crumbling Italian-type sausage). In a medium bowl, toss the chicken with the paprika, pepper, salt, basil, thyme and oregano. Let sit while cooking the sausage and mushrooms. In a large, 12-inch nonstick skillet, heat 1 teaspoon of the oil over medium heat. Add the sausage and mushrooms and sauté until golden brown, 5-7 minutes. Remove to a plate. Heat the remaining 1 teaspoon oil in the same skillet over medium-high heat and add the chicken/seasonings mixture in a single layer. Let the chicken brown nicely on all sides (don't let it cook through). Push the chicken to the edges of the skillet and add the tomato paste and garlic powder to the center. Cook while mashing and pressing the tomato paste and garlic mixture into the hot skillet for 30 seconds or so before stirring it into the chicken. In a liquid measure cup (or in a blender) combine the flour and chicken broth until smooth. Slowly pour in 1/2 cup of the broth, stirring quickly and thoroughly. After the mixture thickens a bit, continue adding the broth slowly, stirring or whisking quickly to incorporate the broth throughout the chicken. Stir in the Worcestershire sauce and bring the mixture to a simmer. Cook for 5-6 minutes until the chicken is cooked through and the sauce is bubbly and thickened. Add the mushrooms and sausage back to the skillet and heat through. Season to taste with salt and pepper. Off the heat, stir in the sour cream. Serve over hot, cooked egg noodles, rice or quinoa. Garnish with fresh parsley or green onions, if desired.